Wednesday, Aug. 29th, the Hammond History Action Team (HHAT) met to discuss updates and fall initiatives. The key topic was an upcoming "History Inventory Day." 5:00 PM on Tuesday Sept. 18th in City Council Chambers (312 E. Charles). The Hammond Historic District Commission will meet on Friday Sept. 14 at 11:00 AM to discuss landscaping guidelines, temporary signage guidelines, and any September applications. Other topics may be discussed. There will be no formal voting or approvals. This working session will be held in the Hammond Building Department Conference Room at 219 E. Robert Street. In order to get on the August Agenda for HHDC review, an application must be submitted to the Hammond Historic District Office either in person (219 E. Robert St.) or via email (historicdistrict@hammond.org) by 1:00 PM on Friday August 10th. The Hammond Historic District office will be closed from August 8th - 13th, 2018. The monthly meeting isscheduled for August 15th, 2018 at 11:00 AM in City Council Chambers. Applications to get on the August HHDC meeting agenda are due Friday August 10th, 2018. Please email questions, comments, or applications to historicdistrict@hammond.org. You may also drop applications off at the Building Department front desk. If dropping off in person, be sure to provide an email so that a message confirming receipt can be sent. CLICK HERE to retrieve a hyperlinked agenda. Certificate of Appropriateness (COA) applications for July approval are due by 1:00 pm on Friday July 13th, 2018. Applications can be turned in in-person (219 E. Robert St.) or via email at historicdistrict@hammond.org. City of Hammond Building Department – 219 E. Robert St. The Hammond Historic District Commission will meet Monday June 18th, 2018 for a working session to discuss monthly meeting agenda items. CLICK HERE for a copy of the agenda. There will be no formal review and no voting during this session. Certificate of Appropriateness (COA) applications for June approval are due by 1:00 pm on Friday June 15th, 2018. The Hammond Historic District Commission will convene in special session Friday June 8 at 10:00 AM to review an application for signage for 113 N. Oak. The session will take place in the City of Hammond Building Department conference room, 219 E. Robert St. The Hammond Historic District Commission will meet tomorrow, Wed. May 23, 2018, at 11:00 AM to review project adjustments on the exterior renovations at 113 N. Oak Street as well as an application for 400 W. Thomas (Euro Hospitality, LLC). Join us for the first of a series of tours designed to increase the awareness of the rich culture that exists in Tangipahoa Parish. This first bus tour, featuring a few of Hammond's little known African American Points of Interest, will pick up at the statue of Doctor Walter Reed on the west side of Cate Square. Enjoy a little jazz as you discover a few of Hammond's unknown Points of Interest such as the Unnamed Slave Boy Grave. Also included is a tour of the Tangipahoa African American Heritage Museum. Enjoy an evening of history and Jazz in downtown Hammond! 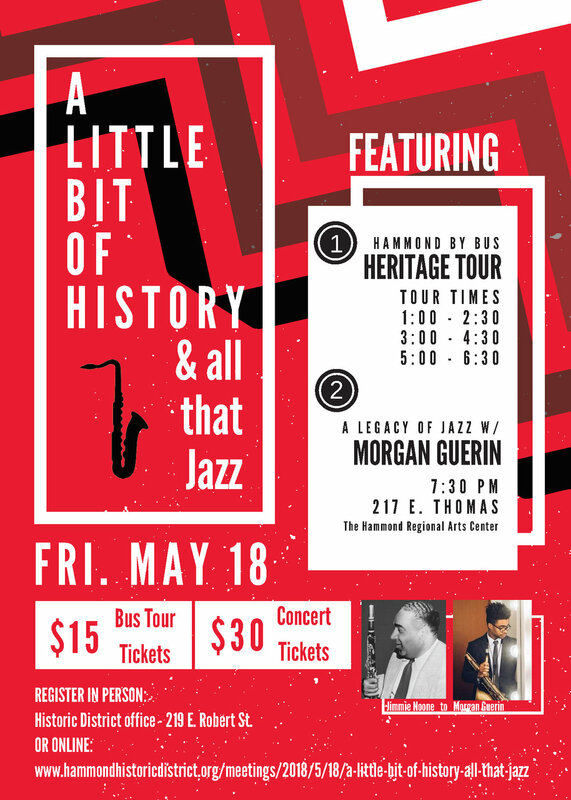 Hear the music and story of Jimmie Noone - a great jazz musician whose beginnings were right here in Hammond - and then be treated to the live jazz stylings of Morgan Guerin, a young musician who is taking on the jazz world by storm! He also happens to be a descendent of Jimmie Noone, continuing a jazz legacy that is connected to Hammond. Certificate of Appropriateness (COA) applications for May approval are due by 1:00 pm on Friday May 11th, 2018. The HHDC will meet to discuss May's applications for work in the historic district. The renovations at 113 N. Oak Street will also be discussed. No motions or voting will be made. The Louisiana Architectural Foundation (LAF) and Hammond Historic District Commission (HHDC) present an all-day historic home tour of Mid-Century Modern residences in Hammond! Learn about Hammond's prolific Mid-Century Modern building stock by walking through the structures themselves! MCM architecture came out of the function-over-form ideology and connects building inhabitants in various ways to the nature around them. The tour homes feature authentic as well as carefully renovated MCM features. Walk or take the provided shuttle over the 1 mile route starting at St. Albert Catholic Student Center (where tickets and check-in will be). Tickets will also be available at the Farmers Market during open hours. Includes souvenir cup for the first 200 tickets purchased! If you would like more information, are interested in volunteering, or otherwise have any questions, do not hesitate to reach out to the event organizers - Stacey Pfingsten (LAF) at (504) 579-2489 and Leah Solomon (HHDC) at (985) 277-5684. Certificate of Appropriateness (COA) applications for April approval are due by 1:00 pm on Friday April 13th, 2018. In preparation for the first Hammond Mid-Century Modern Home Tour (slated for April 21st, 2018), the Hammond Historic District Commission presents the second of a two-part lecture series about the architectural history of the United States and Hammond. This second lecture by Howard C. Nichols - Regional Historian and Professor Emeritus at Southeastern Louisiana University - will explain the character defining details of the Mid-Century Modern architectural style as well as its proliferation in Hammond due in large part to local architect John Desmond. Come to the First Christian Church (architect: John Desmond), which was recently listed on the National Register of Historic Places as a fine example of Mid-Century Modern architecture, and learn more about our local architectural history! There will be time after the presentation for questions. In preparation for the first Hammond Mid-Century Modern Home Tour (slated for April 21st, 2018), the Hammond Historic District Commission presents the first of a two-part lecture series about the architectural history of the United States. This first lecture by Laura Ewen Blokker - Principal for Southeast Preservation and Assistant Director of the Tulane University Master of Preservation Studies - will summarize the historical context and character defining details of architectural styles that shape our built environment today. Come to the Hammond Regional Arts Center (HRAC) to learn more about our local architecture as it relates to historic trends!